The Cosmetic Dermatology & Laser Center (CDLC) is located at the Taubman Center of Michigan Medicine. For directions, enter 1500 E. Medical Center Dr, Ann Arbor, MI in your navigation app on your smartphone or on your GPS. A Patient and Visitor Map/Guide is available through Michigan Medicine. Valet parking is often available for a reimbursable $5 fee on the date of any cosmetic procedure. The P2 parking structure is attached to the Taubman Center and can be viewed from the main entrance when driving on E. Medical Center Drive. Michigan Medicine also offers parking tips with more information. 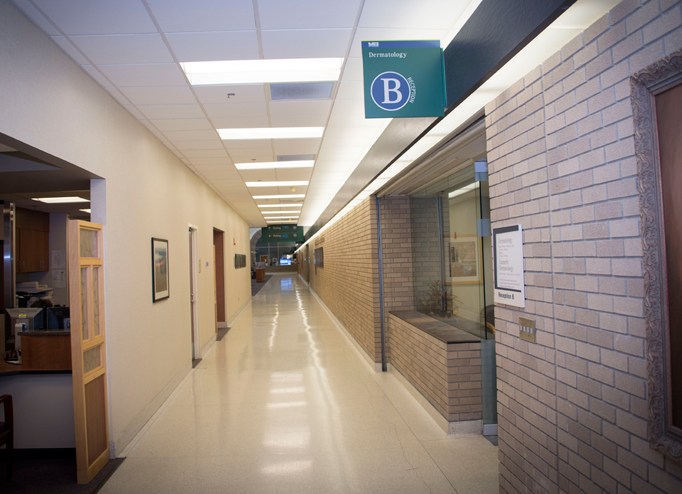 If you are entering after parking in the P2 parking structure, go to your right, once you're inside the Taubman Center to find Reception B: Dermatology. The CDLC is located through the glass door at your left in the reception area within the Dermatology suite. If you valet park and enter through the main hospital entrance, Reception B - Dermatology will be to your left as you enter the Taubman Center. To receive directions directly from one of our Patient Services Associates, call 734-615-0682.